Common clues: Dusseldorf denial; Ja's opposite; Ulm uh-uh; Nuremberg negative; Ruhr refusal; “Fat chance,” in Frankfurt; No de Cologne? Hogan: Warren, I want to talk to you. Schultz: Nein, nein, nein, nein, nein! That is verboten! 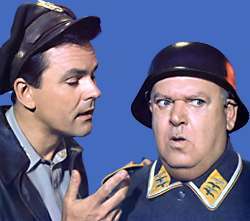 Hogan: You sound like Klink. Schultz: Insults will get you nowhere. -From Hogan’s Heroes, episode 31.